← A river float trip! Red Mountain Campground is almost full due to the arrival of several weekend campers last night. The eighteen sites are well spaced, so it’s easy not to notice the increased population. The crew and I have been here several, lazy days. I’m reading a fascinating series written by Montanan western writer, Richard S. Wheeler. His story takes place in Montana and Wyoming, where the crew and I have recently camped. I run over to the neighboring campsite. It’s strewn with paper and cardboard trash. Fortunately the neighbors aren’t around to see Spike’s head in their fire ring. He’s rooting around in chicken take-out boxes. Spike notices me and darts away. After gathering up the mess, I go after him, intending to give him a scolding. Instead, I burst out laughing. One evening I visit with Ken and Marianne from Texas. 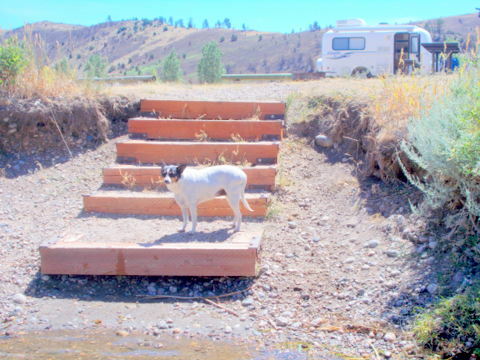 They’re our neighbors on the other side and repeat visitors to Red Mountain Campground. They recently bought a house after fourteen years as fulltimers. Both retired from education careers so we have a lot to talk about. I ask them about the wildfire that ripped across these hills on all sides of the campground this past June. The next day I ask Paul, the camp host, how come the land all around the campground is burnt bare, but not where the campsites are. “Did you put down a perimeter of water?” I ask. “Paul!” I exclaim dramatically. “You saved the campground! You’re our hero!” He laughs at my silliness before walking away, continuing his rounds. Soon after we arrived I repaired the line of rocks that form a slight waterfall. It’s in front of our site’s steps going down the riverbank. It was fun playing in the water, moving rocks. I like to sit with my book in the pool of water formed by the rocks, like I did back at our Zion camp. Only this water is colder and comes up to my waist, so that I’m halfway submerged in my chair. White pelicans drift in flocks overhead or bob on the river, scooping the water with their pouched beaks. 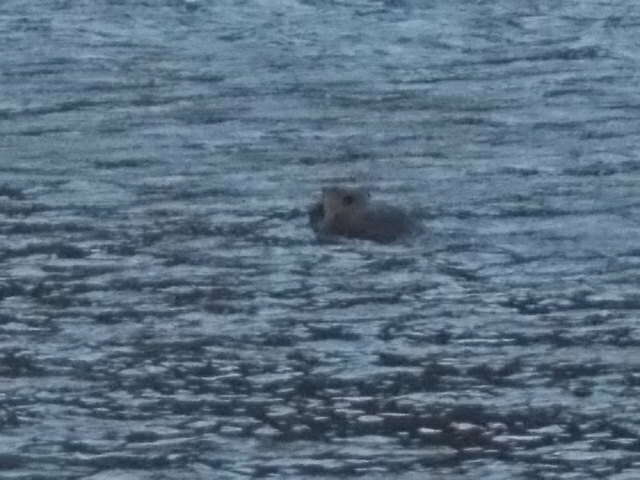 At dusk the heads of otters rise up out of the river. The photo is poor due to low light. At first I thought they were beavers, until Ken set me straight. They position themselves facing upstream with only their head and shoulders visible, and they remain that way for a minute or two before slipping out of sight. Then they appear again to the same position. I feel like I’m living summer the way it was meant to be lived. Lazy days by a river. Dry heat, pleasant breezes, occasionally a cloudburst or spate of wind. 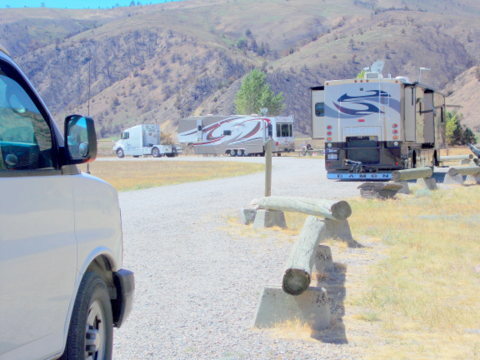 Some of the campers leave during the day, taking excursions to Bozeman, mountain lakes, or even as far as Paradise Valley and Yellowstone. Me, I’m content to stay here by the river. I made one trip into Bozeman. I get enough travel and sightseeing when we move between camps. I’m able to post every day now. I found a place where I can park the PTV and pick up a signal for my Verizon air card. It’s only a few miles away, where the land flattens out for huge cattle ranches. Ted Turner’s ranch is not far from here. I saw his herd of bison — or maybe they were beefalo — way off from the road, as I drove back from a grocery run to Bozeman. 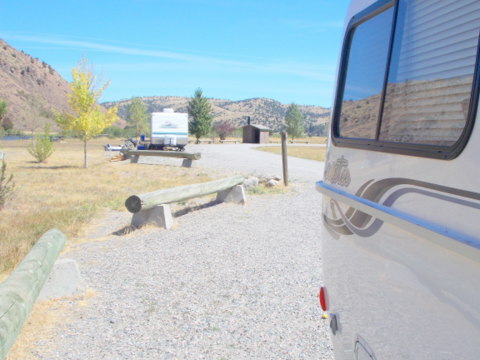 This entry was posted in Simple living and tagged Beartrap Canyon, Montana, nature, Red Mountain Campground, Richard S. Wheeler, RVing, wildfire. Bookmark the permalink. My second try; I might have missed your reply the first time around. This question has been haunting me for weeks. How in the world do you keep the outside of your Casita looking soooooooo nice and clean? I gave up on re-charge batteries ~ same issue that you’re having. Also, how can I send you a photo of Kona and some of our river adventures? I’m sorry I didn’t get back to you. The PTV has a good wax finish. I’ve never waxed the BLT. She’s still wearing her “new” shine. I don’t do much. When I wipe either down with a damp rag, there’s a bit of Turtle wash in the water. I wipe off grime as soon as we’re settled in a spot, usually with a bucket and a rag as I rarely have access to water from a hose. I’ll try to find your email and contact you so you can send the photos. If I don’t run out of signal, either my laptop or my air card runs out of power. It’s always sumpthin! Get a 150W inverter that you can plug into the PTV cigarette lighter outlet. You then plug the usual 110V cord for your laptop into the inverter and power it off the starter battery. Or, you have an inverter and battery bank in the PTV why can you not plug into that inverter to power your laptop? Answering your last question . . . That’s what I do. Sometimes it doesn’t keep up with my power consumption (laptop). What can I say…….perfect as usual…..pics, pets and story telling. Have you thought about putting a list of all your campsites and directions on your resource page or creating a place for others to list perfect spots? Funny you should suggest that, Pat. I was thinking the same thing today. I’ll wait until I have more convenient internet connection. Now I’m having to park alongside the road a few miles from camp with Spike getting restless! Oh don”t be envious, just enjoy, knowing your time will come! Another AMAZING campsite, crowded or not…. a river runs thru it! LOL! While you are out west, try to notice the small flyers announcing the family style rodeos that take place in small town America! We found this one in DuBoise Idaho and guess what??? Doggies were welcome! This rodeo was so much fun! I hadn’t seen one in years! 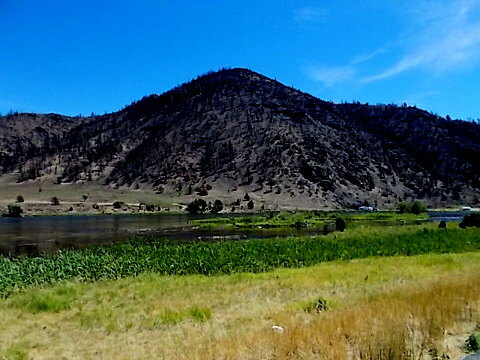 Dubois Idaho is not far from here. I have mixed feelings about rodeos. I’m intrigued by the skill involved, the horses, and the Americana and all that, but I feel for the animals, sap that I am. Hi Sue, Rodeo animals are VERY well taken care of. They are valuable, many are bred for the purpose they are used for, bucking bulls and horses. But to me , the fun part are the kids! They are so cute and so funny riding sheep like they were bustin’ broncs! They had as much fun being in the rodeo as we did watching them! BIG difference between small town family type rodeos and big professional ones! That’s why I said to look for the small flyers, usually home made and posted at grocery store, laundry mats and post offices! Professional rodeos will have huge posters everywhere! I totally understand about your feelings concerning the rodeo animals Sue, and I’m right there with you on that! A great big YES to a list of campsites that you and others have enjoyed. That would be a wonderful addition! Actually the campground is well-designed. I don’t feel crowded in at all… even though there’s few trees. You can tell from the photos how far apart we are. I agree with Sherry. I can see the title now…… PLC (Perfect little campsite) Listings by state…. how great would that be!! I really like how you immersed the pics in the story as you go…. I know it’s more work. But it’s wonderful! Stay Cool!! I should insert photos more often instead of doing slideshows all the time. Love the pic of your chair in the water – looks so cool & refreshing! This whole summer has been so hot in Colorado I only wish I could spend the afternoon with my toes in a cold stream…. just your toes? I like to float downstream with only my head sticking out, like the otters! I walk my hands on the bottom . . . really cools you off. I know what you mean, Connie. It’s always a dillemma… wanting to share favorite spots and then wondering if you’re contributing to their decline by doing so. I can’t keep it to myseld! You could always post the list of all your campsites and directions after you leave those locations 🙂 I cant blame you for not wanting to be invaded. My hubby & I go out on 5 day trips (planning for our full timing days) and we dread Fridays when the crowds come rolling in and the peacefulness goes. I’m glad you found me and the crew, too. How do you like your monocular? I really like the pics during your blog rather than the slide show. Thanks for the feedback on the pics. My monocular is fine, considering how cheap it is. I use it quite often. Looks like a beautiful spot to stay awhile…you know most of the folks I have met from that state are peaceful, contented and happy people…I often wonder if living in places of great beauty help in that dept? Your theory may have some merit. It’s hard to stay wound up in a knot when there’s a river or lake not far from home, clear water to relax in…. Maybe just rural life makes people gentler and happier. I’ll try to do more embedded photos. The slideshows are easy when I have a lot of pics to share. Paperbacks are good for chair-in-the-water reading. That’s one thing they have over ereaders. After I post the next entry, the crew and I are going back to the campground (I park along the road for internet) and take one last swim. Dang, but that does look like a sweet place to hang out. It is sweet. Every good camp I ask myself why I’m leaving… and then another great camp appears down the road. Hello, Sue. So we are in a county campground reading your blog and enjoying every story as it unfolds. Can’t help thinking how your stories appeal to everyone. If I were a teacher I would be using your blog for students to learn about life. Your stories contain so many lessons….pet care, budgeting, wildlife, geology, photography, map reading, national treasures, conservation of our natural resources, and so much more. Just the right mix of humor and serious information. I can see students of every age latching on to these adventures and imagining how they, too, could enjoy the simple things in life. While so many women are flocking to bookstores to buy their copies of 50 Shades, I look to my computer daily to find your latest posts. I like to spend time with hubby huddled together reading your blog, laughing out loud at the happenings of the day or worrying about you and your furry kids when we don’t see a post for a few days. I have to thank my friend, Darlene for making us aware of your blog and you, for entertaining us. Bless you. Karen, a delightful comment! I never gave much thought to the overall content of my blog. I guess I do write about anything and everything that comes my way. I’m glad and proud that you think so highly of my stories about my life with my crew on the road. Thanks for writing. Love your descriptions, Sue! Thank you. This is my first blog and I just don’t have time today to go backward and read the previous ones, but one day I will. I do teach and would love to share your blog with my kids, but our district blocks blogs. It drives me crazy. Welcome to my blog, Garri Ann! I’m happy you are here. I’m kind of glad you can’t share my blog with your students… Then I’d have to worry about being appropriate. Once in a while I let ‘er rip . . . Your chair in the river looks sooo inviting – today it was 103 in Dallas, and that was cooler than this past weekend LOL I am really enjoying your posts and your adventures. I got a huge laugh out of Spike wearing the deli bag. My Oliver has a penchant for shredding napkins and tissues and then looking at me like, who me? I’m glad you are enjoying my blog. How do you Texans put up with that heat, year after year? I thought I would DIE when I got caught in it last summer.